SUBSCRIBE (IT’S FREE!) AND GET A FREE BOOK! Saw a HUGE personal Star Wars collection. Ate Kelly’s homemade stuffed hamburgers and gluten-free fruit pizza. Ate Cindy’s homemade pork loin sandwiches and cherry pie. Ate the Garbage Plate at Frank’s Diner in Kenosha, WI, which has been profiled on Diners, Drive-ins and Dives. And were shocked to discover the large electric plug on the RV had started to melt! Conversation overheard in the back of the RV between Max (8) and Mason (4). Mason refuses to try eggs, and now probably never will. P.S. WANT TO REMEMBER YOUR PAST, AND WRITE ABOUT IT? 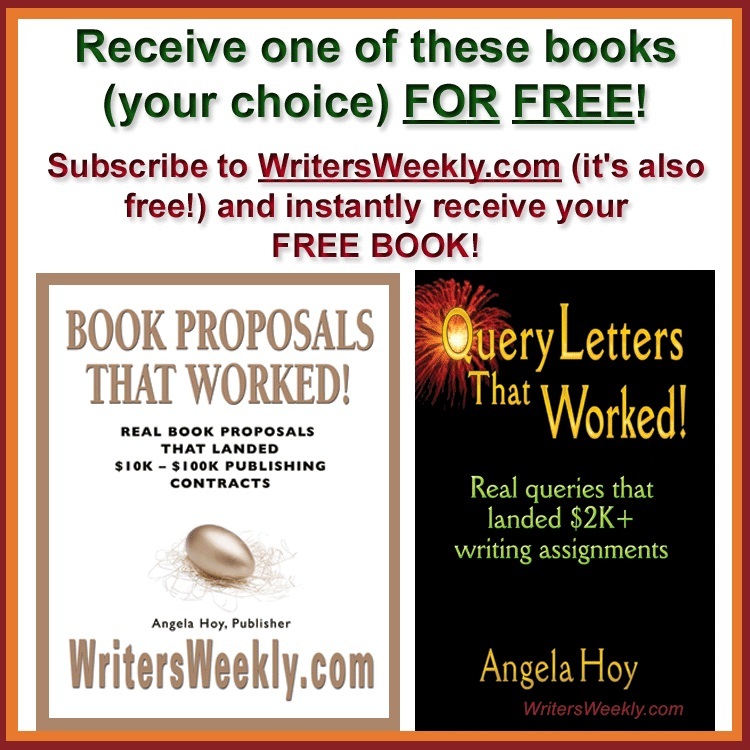 Get Paying Markets for Writers AND A FREE BOOK! After clicking "SUBSCRIBE" above, check your email to confirm your subscription. Once you click on the link in your email, you'll be taken to a page on our site where you can instantly download your free book. NOTE: If you don't receive our email, please check your spam filters. 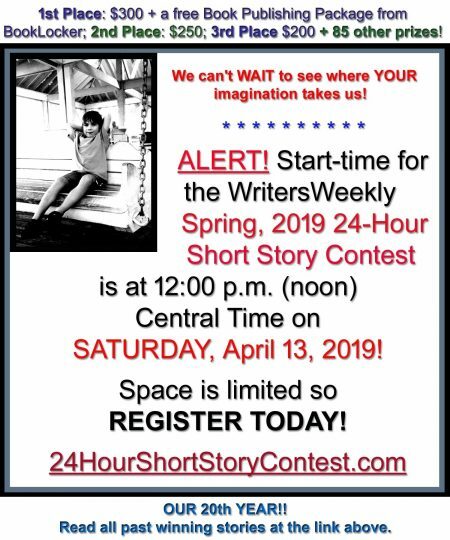 Please whitelist emails coming from writersweekly@writersweekly.com. How Many Copies Of Your Book Would You Have To Sell In Order To Break Even? 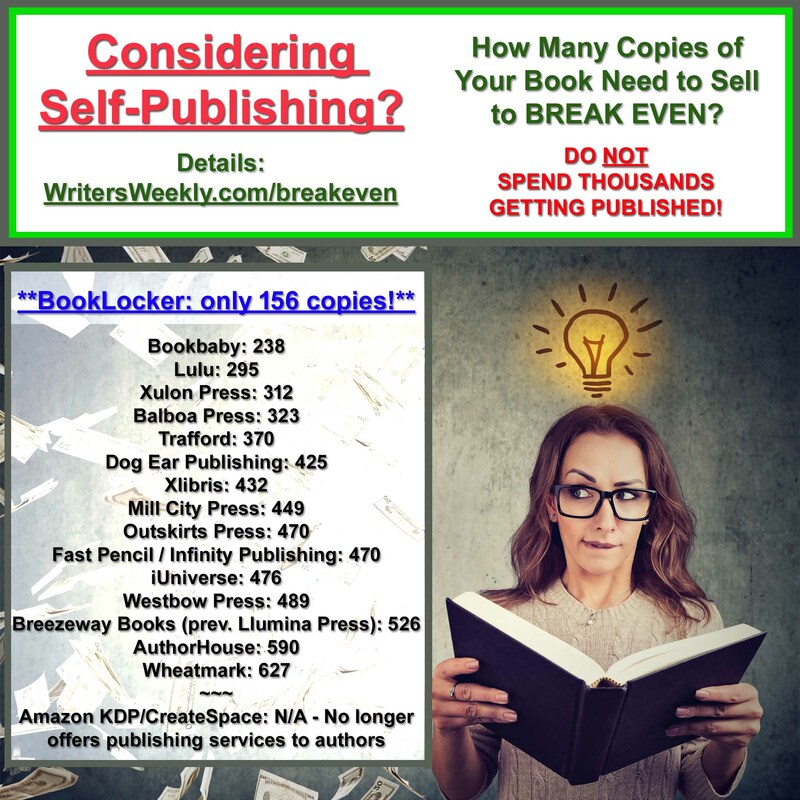 UPDATED – 2019 Self-Publishing Price Comparison! SELF-PUBLISHING IN 2019? – How Many Book Sales Needed to Recoup Your Investment? POD SECRETS REVEALED: “Free Publishing Guides” Are Used To Harvest Your Email Address, Phone Number, And More! P.O.D. SECRETS REVEALED: “Free” P.O.D. Services Can Be Very Expensive! P.O.D. SECRETS REVEALED: Ridiculous Contract Clauses! 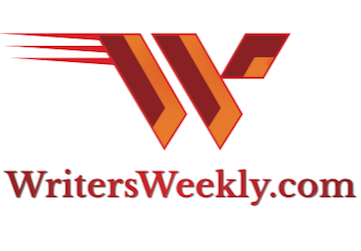 WritersWeekly.com is one of the oldest and most respected sites on freelance writing. It has been published continuously since 1997. It’s part of the BookLocker.com, Inc. family of businesses, which includes POD and ebook publisher BookLocker.com, Abuzz Press and Pub Preppers.